The Haunted Man and the Ghost's Bargain by Mark Lemon. Edward R. Wright as A. Tetterby. No novelty was required at this theatre, on Tuesday, with the attractions of the only version of the "Haunted Man" and the last burlesque--the "Enchanted Isle." The house was as crowded as it always is; but where every night at this lucky theatre appears to be a Boxing Night [December 26], there is little to remark upon. We have engraved the great comic scene of Tetterby (Mr. Wright), with his "almost any amount of small children you may please to name." The scene is Tetterby's arkite room, at the back of his shop. Mr. Wright's performance is a piece of rich humour throughout, with little or no exaggeration, though the character is a tempting one. The infantine folks never fail upon the stage; and in this case, their freaks, combined with their father's drollery, form a lively relief to the piece. 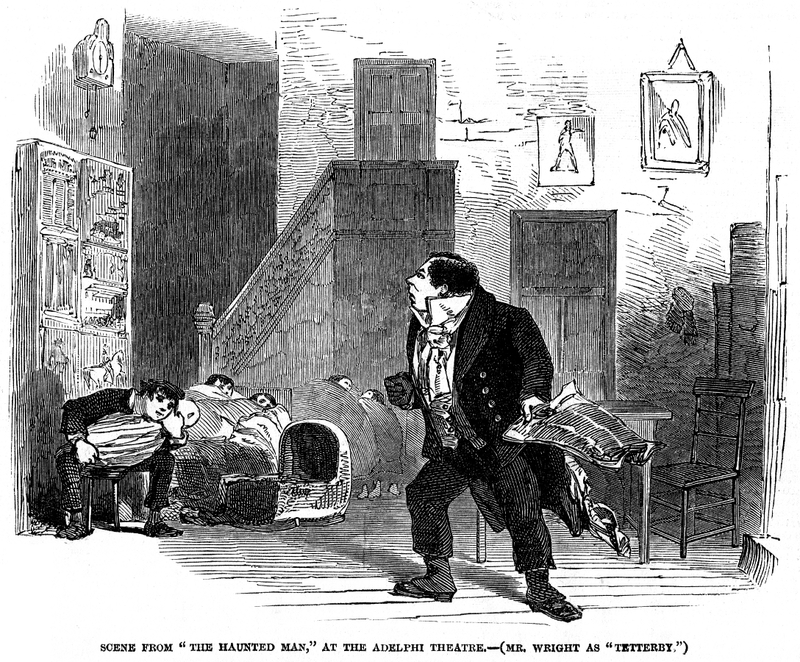 But the best accompaniment to this scene is the extract from Mr. Dickens's work--a truly Bozzian scene, quoted in our Number of last week.